Jeff and Frances Gibson had an agreement: He would name their first child, and she would name their second. Both of them had always loved Jade, so that was a no-brainer for Jeff. When Frances got her turn, she decided to stick with gemstones as a theme for their next daughter. She would be named Sapphire. In a unique and spectacular style that befits the names their parents gave them. Using the knowledge and advice she received in the Institute for Entrepreneurship and the skills she refined in the music program, Gibson started her own business, Jade Strings. With Jade on violin, Sapphire on harp and a mix of string musicians filling out the group, they served over 200 clients and racked up $80,000 in revenue by playing at weddings and special events in 2018. “People will say, ‘That’s Jade and Sapphire from Jade Strings,’ ” she says. “It’s a branding thing now. It’s how people remember us, because it’s a creative name. So far, so good. Gibson was precocious and prodigious from the very beginning. She picked up the violin at age 7 and five years later was playing with the Naples Philharmonic Orchestra Youth Orchestra—a plumb gig that she kept until she entered FGCU in 2016. By middle school, she had learned to play the viola, classical guitar, cello, harp and ukulele. She focused on viola, and has taken it to the highest levels, playing with Itzhak Perlman, Cirque du Soleil, Electric Light Orchestra, the Alan Parsons Project, Frankie Valli and Amy Grant, and has been featured in the “Game of Thrones” TV series orchestra performances. You know you have arrived when you have a viola in your hand and you’re in the vicinity of Perlman, the legendary Israeli-American violinist and conductor. Gibson, a senior majoring in interdisciplinary entrepreneurship with a minor in music performance, credits the mentoring she received at FGCU. Dr. Sandra Kauanui, director of the university’s Institute for Entrepreneurship, helped her with public speaking, pitching ideas and figuring out what kind of people she needed on her team. Mark Bole, entrepreneur in residence at the institute, helped her with financials and pitching for the Runway Program’s competition, which she won in the fall semester of 2018 to collect the $9,000 prize. “The entrepreneurship program is helping me think more critically on the back end of things,” she says. “I always knew I liked marketing and knew I liked music, but there’s a lot more that goes into it. It’s learning how to trust people to do big work for you. It’s learning to manage people and time. I had the creative side down. I just needed the logistical side down. Her advice for entrepreneurship students is clear and simple: pursue your passion. 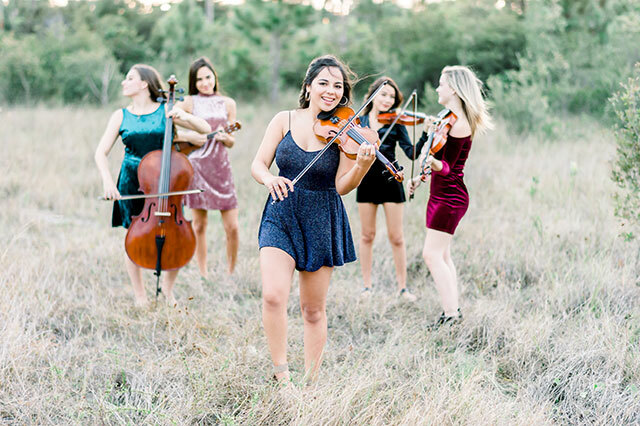 Her passion is driving her to evolve and grow her business, which has employed other FGCU students: Sarah Ball, violinist and elementary education major; Laura Del Agulia, ukulele, biology major; Madison Neill, cello, music performance; Antonella Chiappo, cello, music therapy. She always wants weddings to be part of the business — and she plans to branch out to other popular wedding destinations such as Hawaii, California and New York—but her dream is to work with pop and jazz artists, adding instrumentation into their music. “We’re starting to offer packages where we play with a track and a beat and we add the violin on top of it—mixing modern music with classical instruments,” she says. “We only recently started offering this joint package of DJ and strings collaboration, but every time I’ve pitched it, people love it. Beyonce? Well, with Gibson’s musical passion and entrepreneurial spirit, why not?